Linebacker Mack Wilson of the Alabama Crimson Tide stretches the ball into the endzone after an interception Monday night at the Sugar Bowl New Orleans. Alabama will appear in their third straight national title game after beating clemson 24-6. The Crimson Tide eked their way into the NCAA football playoffs this year, but they rolled into a third straight national title game Monday night against nemesis Clemson. Alabama dominated the Sugar Bowl — a rematch of the 2016 and 2017 title games, which the Tide and Tigers split — from the start, but the 10-6 halftime score suggested another nailbiter was possible. Alabama’s defensive players erased that possibility in a span of seconds in the third quarter. Hulking defensive lineman Da’Ron Payne got Alabama the ball with an interception, then made an unusual appearance with the offense and caught a short touchdown toss from quarterback Jalen Hurts. On Clemson’s first play after the ensuing kickoff, Alabama linebacker Mack Wilson caught a tipped pass from Clemson quarterback Kelly Bryant and ran it back 18 yards for a score. The suddenly insurmountable 24-6 score would hold the rest of the game. Alabama’s defense kept Clemson pinned down from the start; the Tigers barely managed 100 total yards through the end of the third quarter. No Clemson rusher had more than 22 yards, and only half of quarterback Kelly Bryant’s passes found their target. The win puts Alabama in the Jan. 8 national title game against Southeastern Conference rival Georgia, winner of the Rose Bowl earlier Monday. Running back Sony Michel of the Georgia Bulldogs scores the winning touchdown Monday against the Oklahoma Sooners at the Rose Bowl in Pasadena, Calif. The win sends Georgia to the NCAA football title game. 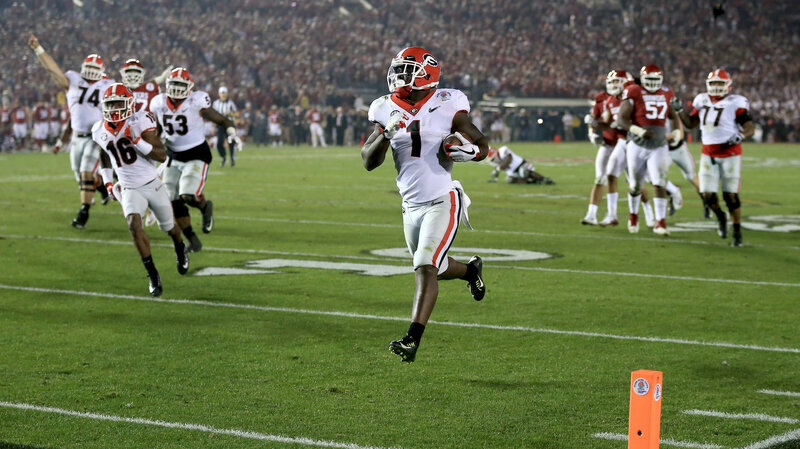 Senior running back Sony Michel kept Georgia in that game for three quarters as they trailed Oklahoma, got the Bulldogs back to a tie at the end of the third quarter, and got them into the national title game in double overtime Monday night. He covered 222 total yards doing it, including touchdown runs of 75, 38 and 27 yards. Senior running back Nick Chubb added 145 yards and two touchdowns, one of them on a 50-yard run. The Bulldogs needed every inch of it in the 54-48 win, as Oklahoma’s Heisman-winning quarterback, Baker Mayfield, and sophomore running back Rodney Anderson sprinted the Sooners down the field again and again. Anderson finished with 201 yards rushing, while Mayfield threw for 287 yards and two touchdowns — and even caught a touchdown himself. But Mayfield was also sacked five times by the Georgia defense, and wasn’t able to get much going once the Sooners got to overtime. Oklahoma matched Georgia’s field goal in the first OT, but kicker Austin Seibert’s second attempt was deflected by senior linebacker Lorenzo Carter. That meant all Georgia needed was a field goal of their own in double overtime. With a start at the Oklahoma 25 in the college OT format and kicker Rodrigo Blankenship nailing a Rose Bowl-record 55-yarder earlier in the game, that seemed likely. But as he had all game, Michel broke free. His nearly untouched run up the left sideline ended the game and put Georgia in title game. The game will be broadcast from Atlanta by ESPN at 8 p.m. ET.